Linking to existing content requires that your PDF file resides somewhere that is publicly accessible – like Dropbox or Google Drive. Since I do so much work in Acrobat, I’m going to use the Acrobat.com cloud service, which is directly integrated with Acrobat and Adobe Reader. This cloud-based service is especially useful because your PDF files can be accessed from any computer or mobile device, which is perfect for Facebook. If you don’t have Acrobat or Reader installed on your system, you can also create your own free account on Acrobat.com and access it using your web browser. First, I’ll upload my PDF file to Acrobat.com. You can either do this by pointing your browser to files.acrobat.com and signing in. Or, from within Acrobat or Reader by clicking on the cloud icon in the toolbar, which will upload your PDF file to Acrobat.com. I’ll use the cloud icon from within Acrobat. 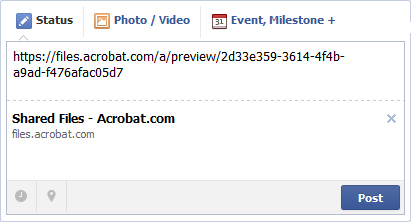 Next, open your web browser and navigate to files.acrobat.com and sign in if you haven’t already. Check the box next to your PDF file and click the Send File icon. Under Send To check the Public Link box and click the Create Link button. Once the public link is generated select the text in the link and copy it and click Close. 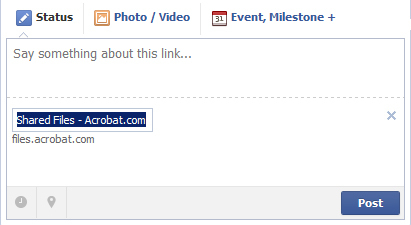 Open your Facebook page and paste the link into a status update (don’t hit Post yet). The long URL has a lot gibberish in it so go ahead and delete it by highlighting the link and hitting the delete key. 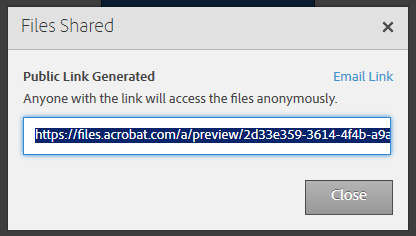 Next customize the generic link title by hovering over the Shared Files – Acrobat.com text until it highlights in yellow and then click on it to change it to something more meaningful. If you would like to learn more about the Acrobat.com cloud service, check out my session on Using Files with Acrobat.com in Learn Acrobat XI on Udemy.com.